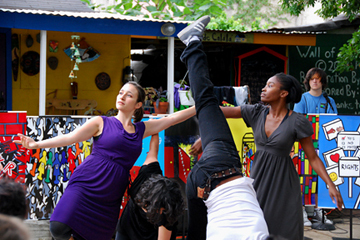 COSACOSA engages people of differing backgrounds to work together toward a common goal through participatory art-making. Since 1990, COSACOSA has brought together thousands of citizens from over thirty Philadelphia neighborhoods to learn about art, about each other, and about how to work together. Each project identifies a community issue to explore through one of many possible artistic disciplines  from mosaics to music, from painting to poetry, from interactive theater to an intercommunity art garden. Collaborating with professional artists, city residents strategize, design, and create new works of, by and for their communities. Art can honor our past, inspire our present, and challenge us to create the future we'd like to see. COSACOSA's goal is the education of our citizenry and the empowerment of our city's neighborhoods  that the project participants will continue to work together for a better future, within and without the boundaries of their own cultures and communities. 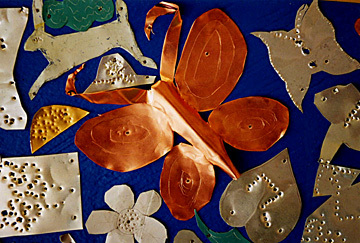 program providing all of our city's residents with meaningful opportunities to create art;. • lessening the physical, social, and economic barriers that often limit the audience for art and art-making;. • exposing our project participants to artist-leaders who represent new ways of working and thinking from those role models they may have previously encountered;. • building a sense of community ownership and participation among the project participants. 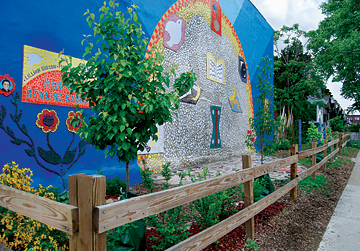 COSACOSA's Healing Garden in North Philadelphia's Nicetown-Tioga neighborhood. Changing Places dance performance and Change in the Making poster exhibition at Norris Square Neighborhood Project. Safe Harbor milagros representing our constituents' experiences of healing and hopes for the future.